Why do patients request a brow lift? With the passage of time the ligaments that anchor the skin of the forehead stretch resulting in descent of the brow. This results in a lowering of the eyebrows and the appearance of folds of skin on the upper eyelid. Patients say that they attract unwelcome comments about being tired or worried from acquaintances and colleagues at work and are unhappy about the frown lines on the forehead and between the eyebrows. This is often a cause of significant distress and results in a request for a consultation to discuss rejuvenation of the upper half of the face. Are there any reasons for a patient not to have a brow lift? Patients who are actively smoking or on blood thinning medication such as aspirin or warfarin have a higher risk for postoperative complications such as bleeding, wound infections and delayed wound healing. It is advisable not to consume nicotine in any form for at least two weeks before this procedure and at least two to three weeks after. Medication such as aspirin or warfarin may need to be stopped if they are not absolutely essential at the appropriate time before surgery. This should be discussed with your Consultant or GP. 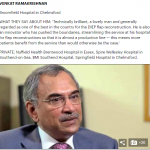 The procedure is carried out under general anaesthesia and usually involves an overnight stay in hospital. It can be carried out endoscopically, www.coaptsystems.com ie with the help of a telescope through a small incision inside the hairline which heals well and is not very visible after a few weeks, or it can be carried out as an open procedure within an incision across the hairline in a hidden part of the scalp. The incisions are sutured and quite often a head bandage is applied for the first couple of days after surgery. Patients are discharged home the following day and are able to wash and shampoo their hair as normal. Sutures are removed a week after surgery. Most patients experience significant bruising and swelling of the forehead and may have a black eye, which normally resolves in about a week. The eyebrows may appear excessively elevated for a few days after surgery but they descend to a more natural position within a period of a couple of weeks. Most patients are able to return to work a couple of weeks after the procedure. What are the potential complications for this procedure? Like any other surgical procedure brow lift has complications such as bleeding, haematoma (blood clot under the skin), infection, visible scars and asymmetry. There can be a small amount of hair loss on either side of the scar but this hair normally grows back after six to twelve months. 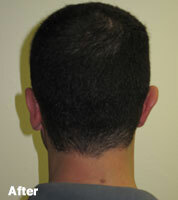 The scars can be visible especially in men as the hair line recedes. Very rarely the nerve that supplies the forehead muscle which lifts the eyebrow may be stretched or damaged in this procedure and can result in an inability to raise the eyebrows. Reasonably mobile 1-4 days complete rest. Blepharoplasty is one of the most popular surgical procedures. It is a procedure to remove excess skin, along with fat and muscle, from the upper and lower eyelids. Eyelid surgery can lift drooping upper lids and reduce the puffy bags that form below your eyes. For the lower eyelids the incision starts underneath the eyelashes and extends 1cm or so outwards into the crow’s feet area, the skin is then lifted upwards and outwards, gently tensioning the area and the overlapping skin removed. Again the incisions will then be closed with very fine sutures. Are there any reasons for a patient not to have this procedure? Patients who are actively smoking or on blood thinning medication such as aspirin or warfarin have a higher risk for postoperative complications such as bleeding, wound infections and delayed wound healing. It is advisable not to consume nicotine in any form for at least two weeks before these procedures and at least two to three weeks after. Medication such as aspirin or warfarin may need to be stopped if they are not absolutely essential at the appropriate time before surgery. This should be discussed with your Consultant or GP. After surgery you may have lubricating ointment on your eyes and maybe a bandage. Some bruising and swelling will be experienced during the first and second weeks, however the majority of the swelling usually subsides after the first 10 days. Your eyes may feel dry at first but eye drops can help with this. Any sutures are usually removed after 5 – 7 days. Scars will form as a result of the surgery. Overall these scars heal relatively well but will differ in each individual patient. All surgery carries some uncertainty and risk, but complications are infrequent and minor. You can reduce the risks by closely following your surgeon’s instructions both before and after surgery. You should make known any thyroid disease, high blood pressure, diabetes or eye disorder such as detached retina or glaucoma. Occasionally a pool of blood can collect under the skin after the operation (haematoma) this usually disperses spontaneously over two or three weeks. Quite commonly the margin of the lower lid is slightly pulled away from the eye during the first day or two after surgery due to swelling. This will settle on its own or with the help of steri strips. Some times tiny white cysts can appear along the stitch line. Patients who are actively smoking or on blood thinning medication such as aspirin and warfarin are at a high risk of complications such as bleeding or wound infections and delayed wound healing. It is advisable to not consume nicotine in any form for six weeks before a facelift and a similar time after. Medication such as aspirin or warfarin may need to be stopped (if this is not for an essential or life-threatening condition) at the appropriate time before surgery. This should be discussed with your Consultant or GP. 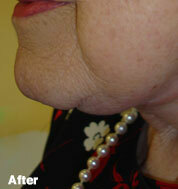 A facelift or neck lift is carried out under general anaesthesia and involves one or two nights in hospital. Following the operation there is a large padded bandage around the neck and face along with a tube drain underneath the skin to remove any blood or fluid that may collect following surgery. The drain is normally removed the day after surgery and so is the dressing around the face and neck. Patients are usually able to shower before discharge from hospital with fresh dressings and an elasticated support for the neck and cheeks. An outpatient appointment is arranged for a few days after surgery for removal of sutures. A small percentage of patients undergoing a facelift can have complications just like any other surgical procedure which include bleeding, haematoma (blood clot under the skin), infection, delayed healing of the wound, asymmetry and scars which are visible in the early post-operative stage but which normally fade over a period of months. There can also be a loss of function or injury to the branches of the facial nerve which is responsible for movements of the muscles of expression in the face. Very occasionally patients may need a small revision procedure. Depending upon the nature and extent of the procedure that you need your surgeon will discuss the potential complications with you in detail during your consultation. Sleeping position Sleep on back if possible with 3-4 pillows for first 7-10 nights. Reasonably mobile Total rest 2 weeks – no bending or lifting. Time off work 2-4 weeks depending on type of work. 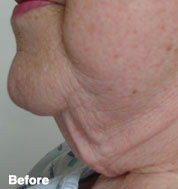 This is a procedure to remove loose or sagging skin under the chin and vertical bands in the neck, “turkey wattles”. Neck lift surgery can be performed alone or in combination with other cosmetic procedures. It involves an incision along the front of the ear going onto the back of the ear. Sometimes it is along the border of the hair bearing scalp. This will allow tightening the fatty layer of the face and neck. 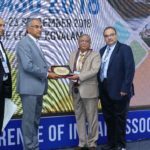 It is generally performed under general anesthetic. In the days after the surgery you might expect to have some swelling and bruising. Both should settle in four to ten days. There may also be some feelings of tightness, burning, pulling and numbness which are quite normal for the first few weeks and resolve on their own. Any discomfort can be controlled by taking paracetamol or medication provided by the hospital. Aspirin and anti inflammatory medication should be avoided as these can promote bleeding. Likewise smoking needs to be refrained from two weeks before surgery and two or three weeks after surgery to allow the best possible healing. If there are sutures these will be taken out a week to ten days after surgery. You should be able to return to work in one to two weeks depending on your type of employment. 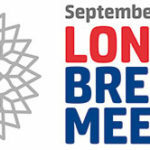 However you will need to avoid physical exercise such as the gym or sports for at least three weeks, possibly longer. A full recovery will take between 3-6 months. A small percentage of patients undergoing this procedure can have complications just like any other operation which include: bleeding, haematoma (blood clot under the skin), infection, delayed healing of the wound, asymmetry and scars which are visible in the early postoperative period but which normally fade in the first few months after surgery. The appearance of the nose can be a significant source of distress as it is a very prominent facial feature. The shape of the nose may be unacceptable to patients due to its size, shape or projection. Some people are unhappy with the shape of the nose because they feel that it is too big, it has a hump, it projects too far forward, the tip is droopy or too wide or that the nose is bent to one side. Others may have had a normal nose which has been distorted by an injury which can also result in obstruction of the nostrils resulting in snoring or difficulty in breathing. What does the procedure for a Rhinoplasty involve? The procedure is usually done under a general anaesthetic and requires a one or two night stay in hospital. The nose is reshaped through incisions which are for the most part on the inside of the nose and are therefore invisible. The cartilage and the bone is reshaped. The incisions inside the nose are closed with dissolving sutures. A nasal pack is put into the nostrils and a plaster is applied to the outside of the nose. Most patients have swelling and bruising of the eyelids following surgery which usually resolves within a fortnight. The nasal pack is normally removed within 24 to 48 hours following surgery and patients are discharged home with instructions. If there are any external sutures they are removed around the fifth postoperative day. The plaster is removed seven to ten days following surgery and a further follow-up appointment is arranged approximately two to four weeks later. Most patients are able to return to work two weeks following the operation. Like any other operations Rhinoplasty can result in complications such as bleeding, haematoma (blood clot, under the skin), infection and a scar inside the nose. Approximately 5% of patients who undergo Rhinoplasty require a small secondary revision procedure for minor irregularities of bone or cartilage. This is usually undertaken a year after the first procedure if required. The ear has a unique shape due to the presence of elastic cartilage. The shape of the ear is maintained by the balance of forces in the elastic fibres of the cartilage. The ears are more prominent in some people than normal and is considered abnormal either because the ear is too far out from the side of the head or it lacks the normal fold close to the outer rim. The prominence of the ear can be corrected by operating on the cartilage and causing it to bend backwards or removing a small piece of cartilage to decrease the protrusion of the ear from the side of the head. Why do people seek correction of prominent ears? Prominent ears are a source of embarrassment as they attract unwelcome attention. People with prominent ears quite often wear their hair long to keep them covered and are often known to refrain from physical activities as the ears become visible when the hair is tied back or gets wet. What does the surgery for prominent ears involve? Surgery can be carried out either under general anaesthetic or under local anaesthetic with sedation. 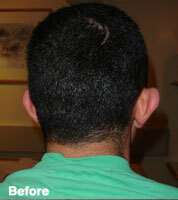 An incision is made on the posterior aspect of the ear and a small ellipse of skin is removed. The ear cartilage is exposed and either scored to cause it to bend or a small piece of cartilage is removed to set the ear back and make it more natural in appearance. 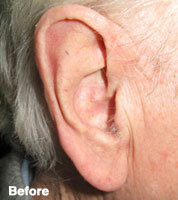 Dissolving sutures are used to close the skin behind the ear. A dressing with cotton wool and a head bandage applied. 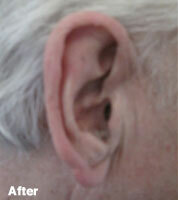 What is the normal postoperative course following prominent ear correction? The head bandage stays on for approximately one week after the operation. An outpatient appointment is made for the bandage to be removed after a week. When the bandage is taken off the ears will appear bruised and swollen but this tends to settle in approximately a fortnight. Patients can shower and wash their hair normally once the head bandage has been removed. A soft elasticated headband must be worn at night in order not to catch the ears on the pillow while asleep. Contact sport is not allowed for four weeks following the operation. Just like any other operation surgery for prominent ear correction can have complications such as bleeding, haematoma (blood clot on the skin), infection and the scar behind the ear which can be red, raised, lumpy and tender.